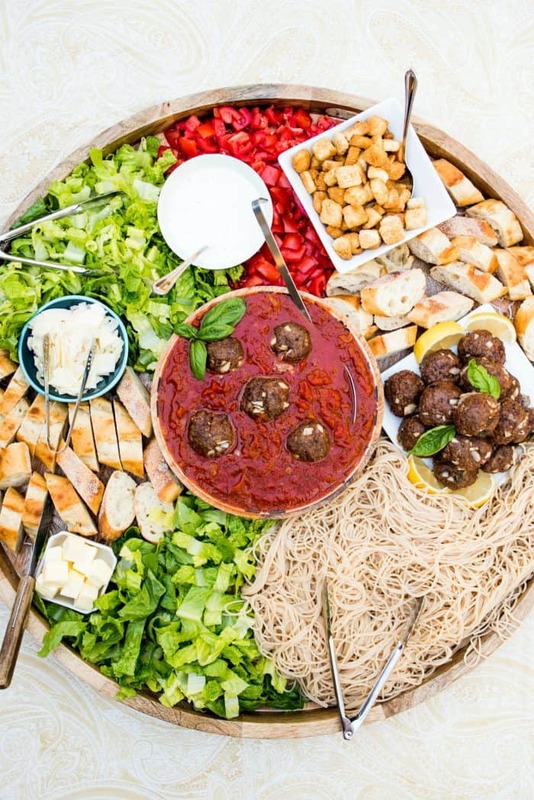 For easy, cozy hosting, enjoy a Spaghetti and Meatballs Epic Dinner Board. The sauce is made with the best tasting Tuttorosso Tomatoes. 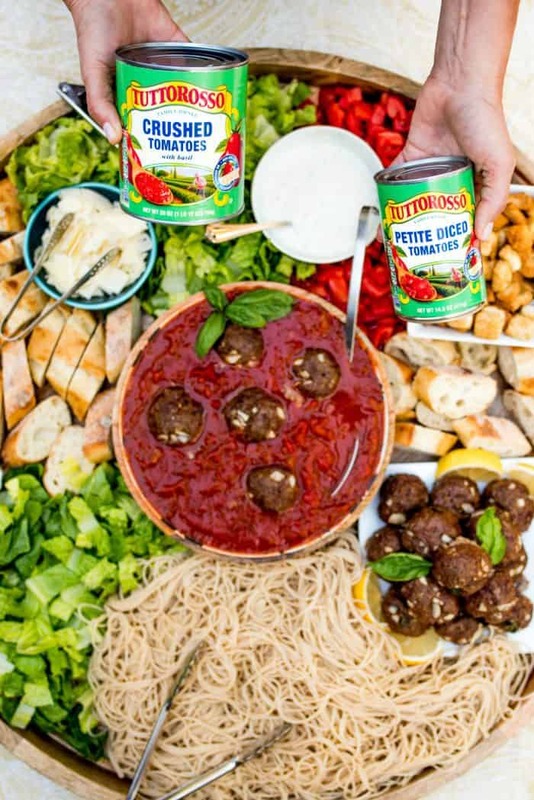 This post is in partnership with Tuttorosso Tomatoes. Friends, Happy first week of October! 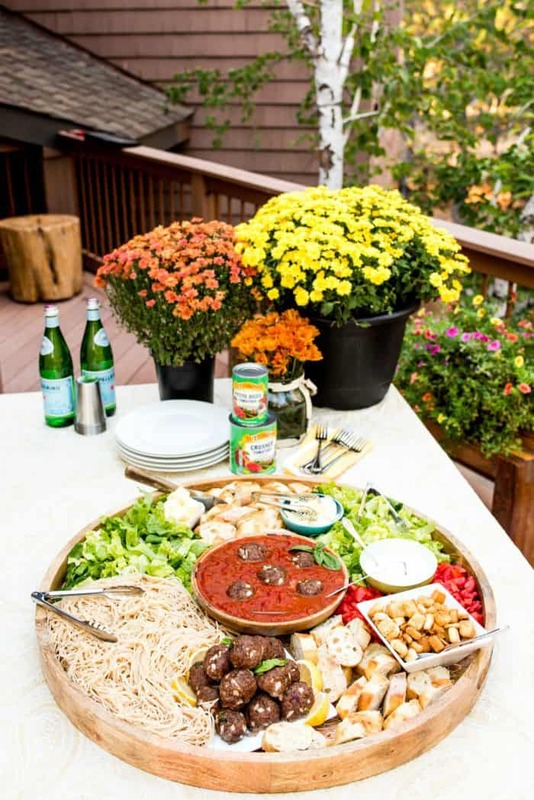 For cozy meals you’ll be serving this month, you may enjoy serving a Spaghetti and Meatballs Epic Dinner Board. 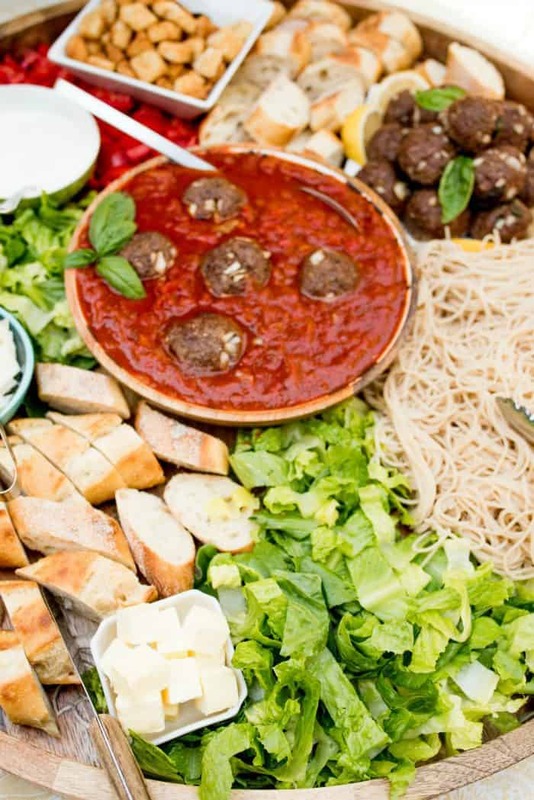 Make your sauce, cook the spaghetti, arrange salad ingredients, and don’t forget the bread. 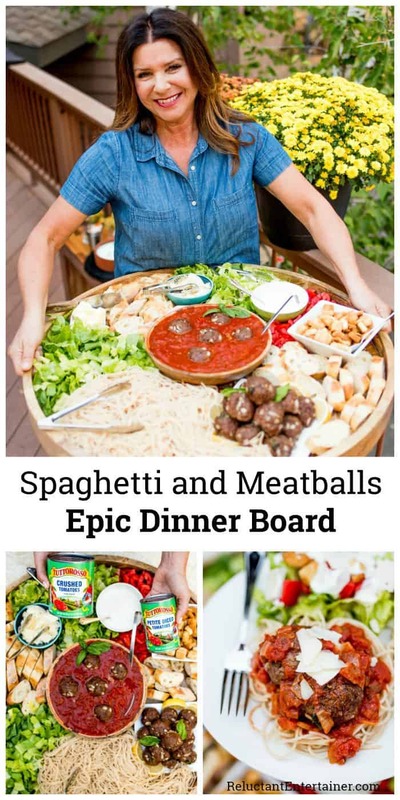 Next, grab a giant round board, and deconstruct a Spaghetti and Meatballs Epic Dinner Board meal. 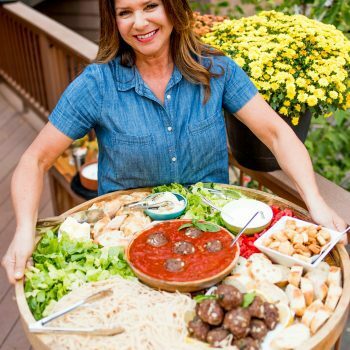 That’s right, add the entire meal to an epic board, place it in the center of the table, and let everyone dig in! Your family will love it. Your guests on the weekend will think it’s the best party they’ve ever come to. Let’s start with the best spaghetti sauce. If you’re looking for new recipes, tips, techniques and ideas to help elevate your cooking and hosting, then you will love the superior quality of Tuttorosso Tomatoes. I keep my pantry stocked with these tomatoes because honestly, they are so rich, vibrant in color, and they take my recipes to the next level. Tuttorosso Tomatoes do not use anything artificial, and their tomatoes are steamed to preserve the integrity of the tomato, so they are natural, plump, and healthy! Every can has a Steam Sealed Flavor-LocTM system to protect the fresh, delicious, vine-ripened flavors. So you know what I mean, the tomatoes do not taste as if they came out of a can! See how thick and red and delicious this sauce looks? Our guests kept saying … the sauce, the sauce. :) Yes, it was that good. And easy! 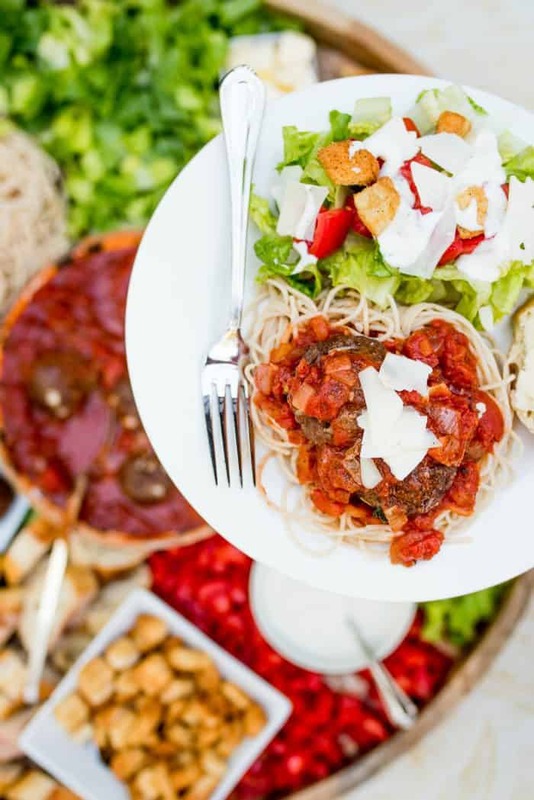 When I take a classic recipe, like Spaghetti and Meatballs, one that I know I can’t mess up on, I use quality ingredients, like Tuttorosso Tomatoes. 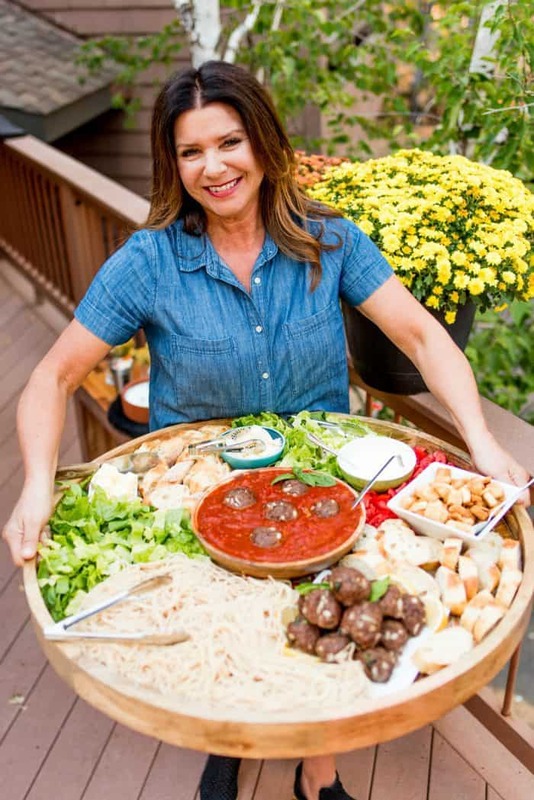 I feel confident I can create the perfect meal for my family and guests when I use ingredients I can trust. 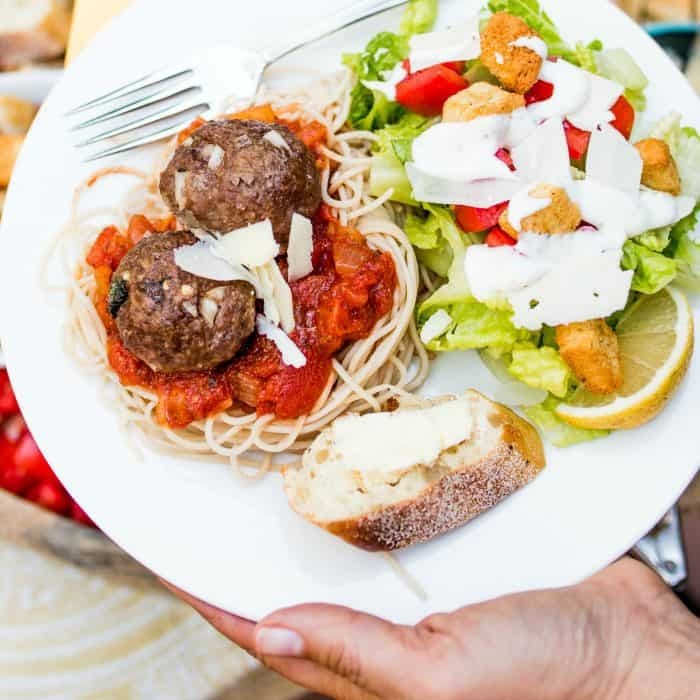 Start with an easy meatball recipe with fresh ingredients. 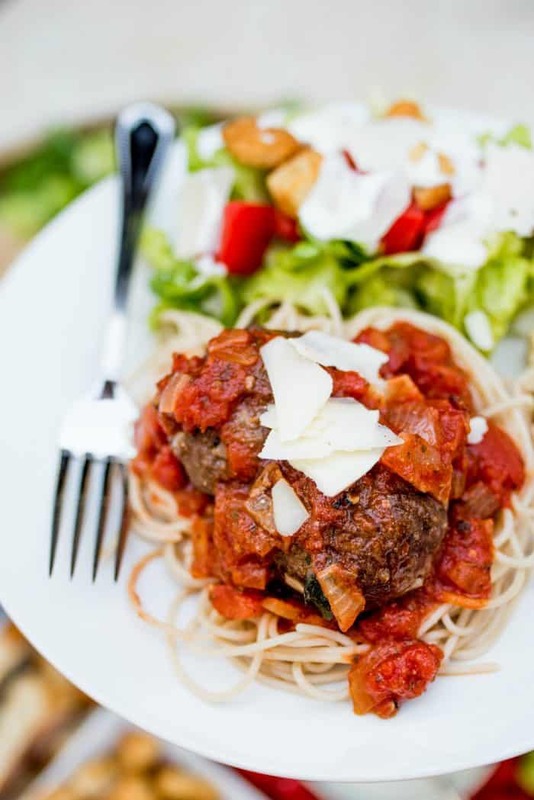 Bake the meatballs while you are cooking the pasta. Bake and slice the bread. Put it all together. Don’t forget the Parmesan cheese and the butter! 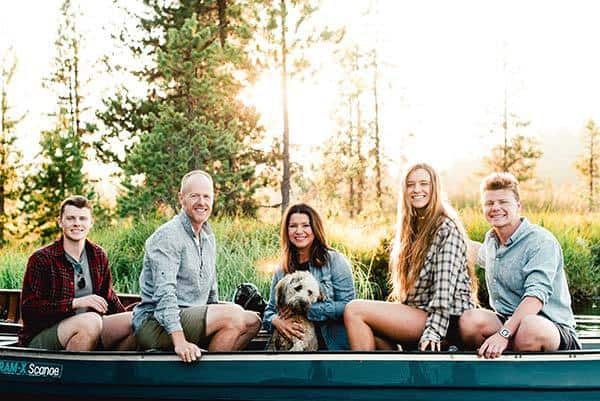 Friends, here’s what I appreciate about and value about this family-owned company: Sustainability is foremost important in how they produce their tomatoes with NON-GMO ingredients and Non-BPA lined cans. I feel good inside knowing I’m giving my family and friends not only my best, but wholesome quality food (thank you, Tuttorosso Tomatoes). There is just something so special about sitting down to eat and chat together. Sharing a meal with others is like inviting them to live life with you–in your own home and space. You are showing that you value their company enough to sit down and stay for a while. Some of our best conversations have happened around this epic board. These are the times we’ve bonded with our kids’ friends, our friends, couples and neighbors, and it’s times like these that I truly cherish. 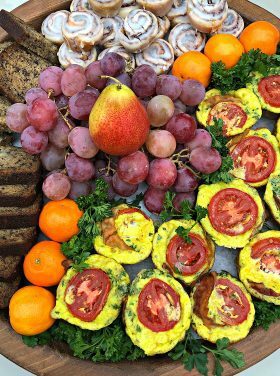 If you are in need of some recipes, try Coconut Milk Tomato Mixed Seafood Soup or Easy Grilled Spaghetti Squash, I love this a Grilled Flatbread Pizza Bar. For dessert, this Pumpkin Chocolate Texas Sheet Cake is a huge hit for a large party! 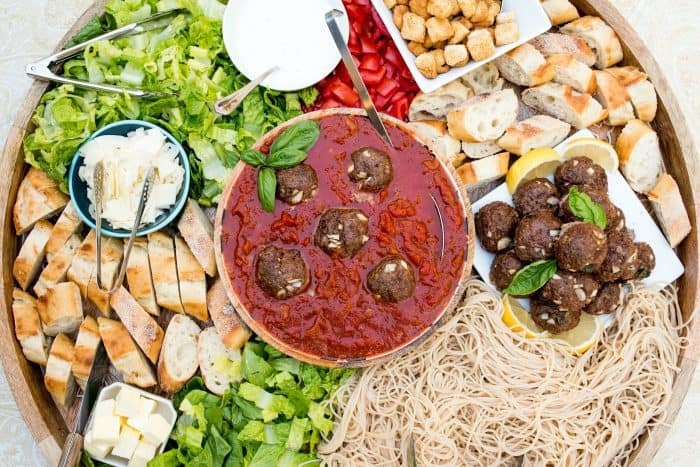 Feed a crowd of 8-10 tonight, or cook 6 ounces pasta to serve 4 and freeze half the meatball mixture for later. Preheat oven to 450 degress. 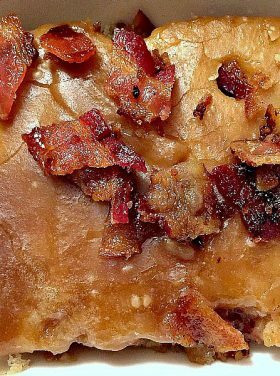 On a larage baking sheet with lip, place down parchment paper. Set aside. In a large bowl, add the beef, bread crumbs, onion, basil, garlic, salt, pepper, eggs, and mix well with hands. (Spray hands with cooking spray for non-sticking). Roll the meat into balls (about 18-24) and place on the baking sheet. Bake at 450 degrees for 15-20 minutes (depending on the size). To prepare sauce, heat a Dutch oven over medium-high heat. Add oil; heat for 1 minute and add chopped onion, 5 garlic cloves, and dried basil to pan; cook 4-5 minutes, stirring. Add tomato paste; cook 1 minute, stirring constantly. Stir in wine; cook 2 minutes. Add tomatoes, sugar, salt, pepper, and water; bring to a boil. 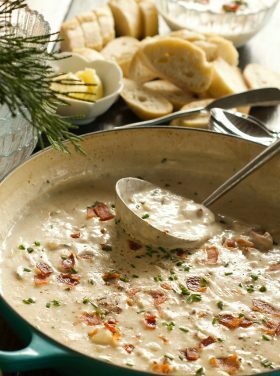 Reduce heat, and simmer 25 minutes or until thickened, stirring occasionally. Add meatballs to the sauce or serve on the side. If serving on the side, drizzle with Worcestershire. Follow freezing instructions, or continue recipe. Cook pasta according to package directions, drain. Top pasta with meatball mixture. Sprinkle with Parmesan cheese. 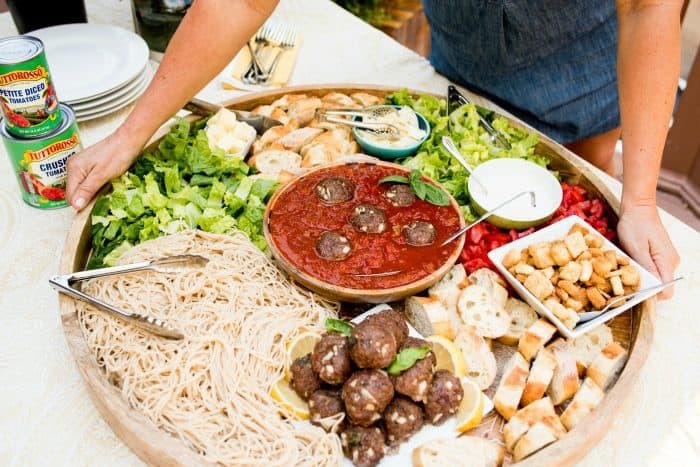 For a large board, serve the spaghetti sauce in the center of the board. Deconstruct a Casear Salad, baguette bread, and the pasta, arranging it on the board. Add fresh Parmesan cheese and butter. Serve! 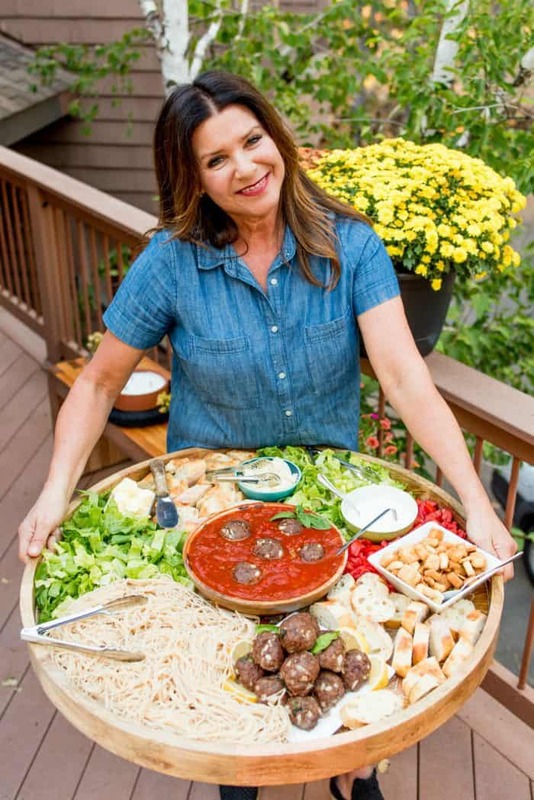 More board ideas: Mediterranean Fish Burger Dinner Board [RE], Whipped Ricotta Board [The Baker Mama], and The Ultimate Build Your Own Sandwich Board [The Baker Mama]. What do you line your boars board with? 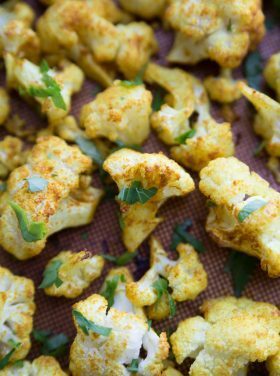 You can use parchment paper, or season the board with beeswax and mineral oil. 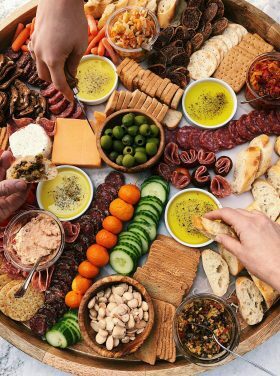 Where do I get that charcuterie board???? I bought it at Pier One! 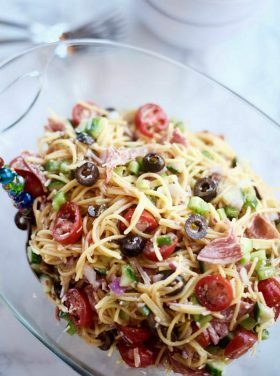 If you make 1 spaghetti recipe (1 package noodles, etc) then however many that serve (6 or 8?) Make it work for however many guests are coming over. You can pack those boards pretty full! Where did you get your board? 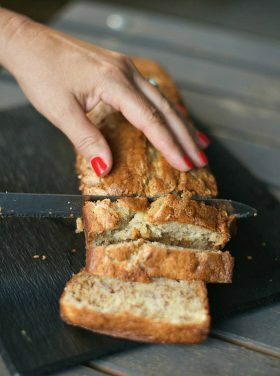 Such a cute idea for a casual dinner with friends! I’m gonna have to check out these tomatoes! I also would like to know where to buy tomatoes please. WHERE DO YOU BUY THE TOMATOES? ?